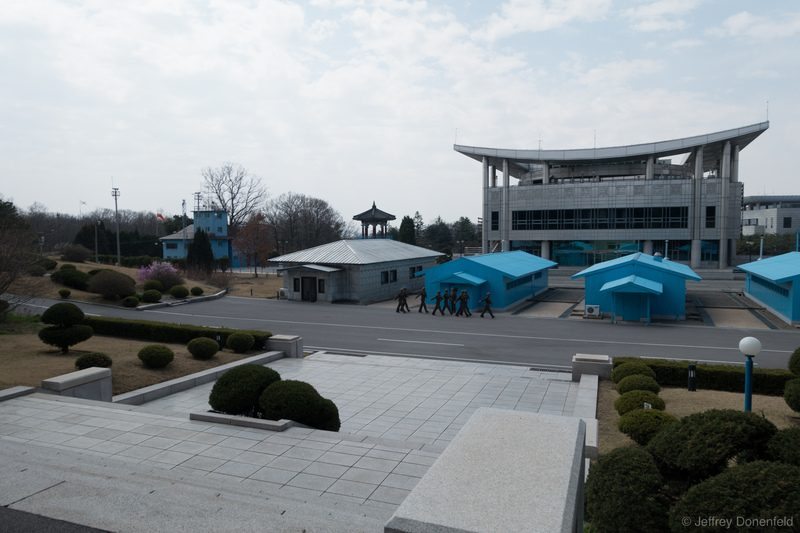 As I approached the steps leading down to the blue buildings at the JSA, a group of DPRK guards exited their security building, and arranged themselves in formation around the MDL Line and blue buildings. The guards were arranged so nobody could pass to the sides of the blue buildings and over the border to the south. Notice also in this photograph that there is an absence of any guards from the South Korean side. The US Military runs the JSA area from the south, and when I visited the JSA area as part of a US Military-led USO Tour, there were American guards giving us the tour, as well as South Korean guards guarding the buildings, AND North Korean guards monitoring the same spaces. The JSA is a neutral zone, and so guards from either side are freely allowed to walk around. When I was there visiting from the north, there was absolutely no sign of anybody from the southern side - no guards, no US Military tour guides, no other groups, or anybody. I'm sure there were actually guards from the south watching us, but there was no sign of them. Also in this picture is the main building on the southern side. While I was on the tour coming from the south, I was told that I was not allowed to turn around and take photos of this building. Interesting to see all of the surveillance equipment on the top. As I approached the steps leading down to the blue buildings at the JSA, a group of DPRK guards exited their security building, and arranged themselves in formation around the MDL Line and blue buildings. The guards were arranged so nobody could pass to the sides of the blue buildings and over the border to the south. Notice also in this photograph that there is an absence of any guards from the South Korean side. The US Military runs the JSA area from the south, and when I visited the JSA area as part of a US Military-led USO Tour, there were American guards giving us the tour, as well as South Korean guards guarding the buildings, AND North Korean guards monitoring the same spaces. The JSA is a neutral zone, and so guards from either side are freely allowed to walk around. When I was there visiting from the north, there was absolutely no sign of anybody from the southern side – no guards, no US Military tour guides, no other groups, or anybody. I’m sure there were actually guards from the south watching us, but there was no sign of them. Also in this picture is the main building on the southern side. While I was on the tour coming from the south, I was told that I was not allowed to turn around and take photos of this building. Interesting to see all of the surveillance equipment on the top.